This week saw YFCU members take part in the popular demonstration and presentation competition which was held on Monday, 12th March at CAFRE Greenmount Campus. Competitors were able to present or demonstrate a topic, item or skill of their choice for a minimum of five minutes up to a maximum of 10 minutes to a judge. 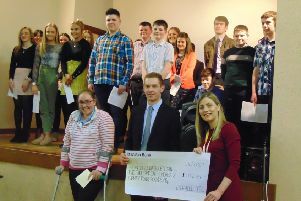 Following the event YFCU acknowledged the high standard of presentations and demonstrations delivered by the 70 competitors and highly commended their efforts. Congratulations to the qualifying competitors from each of the six age categories who now progress to the final held on 21st March at Rainey Endowed School, Magherafelt. YFCU would like to extend its thanks to the judges: Linda Davis, Janette Stirling, Karena Shaw, William Wilson, Jane McCollam, Ian McMaw, Mae Cameron, Louise Dempster, Claire Woods and Avril Herdman. Thanks are also extended to chairpersons: Sarah Dorman, Elaine Paisley, Christine Maybin, Stephanie McCollam, Peter Alexander, Robert Smyth, Gemma Dickey, Laura Patterson, Gayle Murphy, Teresa Connon and Emma Heron for their input in what can be described as a very successful event.